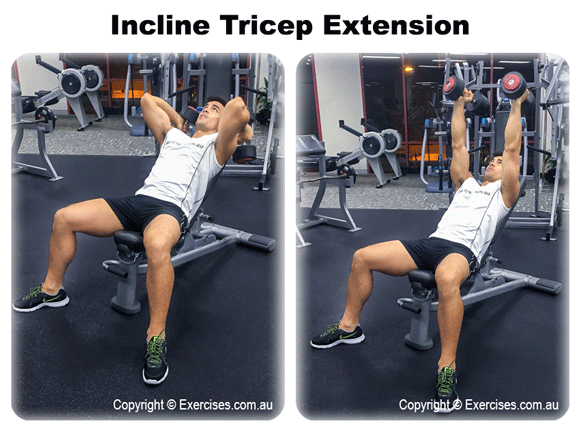 Incline Tricep Extension is a great exercise to isolate the tricep muscles. This exercise is best done after a compound pressing movement for the chest, shoulders or triceps. To get the best results from Incline Tricep Extension, use only light weights so you can focus on proper form and technique. Set an incline bench at an angle of 45 degrees. Pick up a pair of light dumbbells, bring them up to your shoulders and lie back on the incline bench. Make sure your back is firmly on the pad of the incline bench. Press the dumbbells straight up with palms facing each other. The dumbbells should be in line with your elbows and shoulders. Bend at the elbows and bring the dumbbells slowly down until you feel a comfortable stretch on your triceps. Extend your elbows and bring the dumbbells back to starting position. Follow the same path as the descent. Keep your elbows stable and steady throughout the exercise. Do not drop your elbows to your shoulders as this removes constant tension on the triceps. Do not flare your elbows out. This will cause unnecessary strain on your elbows. Make sure your back is securely braced on the incline bench.